The Mexico Public Library attempts to offer a wide variety of books in all areas. In addition to the customary sections of Fiction, Nonfiction, Biography, and Reference, we also display shelves of new arrivals, Classics, Short Stories, and a collection of books pertaining to Maine. Downstairs,we have a growing collection of Children’s and Young Adult books. picture books,fiction, nonfiction, and biographies. growing collection of videos, DVDs, and audio books, available for sign-out to patrons. Also, we have periodicals available for sign-out. electronic encyclopedias, atlases, and several learning games for children. automated in our circulation and card catalog. Our goal is to serve the needs of the community. 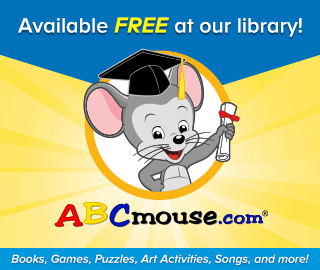 To access ABCMouse, a complete online curriculum for Pre-K, K and early primary grades, click HERE. There are no pop-up ads, no advertising, and no external links. Sign-in information can be obtained in-person at the library’s Circulation Desk. Visit the online material offerings HERE by signing in (you will need your library patron number, found on your library card). Please keep us informed as to how we can best serve you.